When you think about lodging in major cities these days, you have to think outside the traditional channels to understand where all the booking is going. Yesterday the New York Times reported that the “Hotel Market Staggers in New York City,” citing sharp declines in occupancy (-4.7 percent) and average daily rate (-8.6 percent) in Smith Travel Report’s (STR) most recent market report. The article speculated on potential culprits — a weak euro, the loss of demand generators like the Superbowl last year — and highlighted supply growth as the biggest risk to the market. According to STR, 4.4K rooms (4 percent growth) have been added over the past year to the city’s existing supply base of 108.6K rooms, and 14.4K more rooms are under development. Lodging supply is growing far faster than STR reports because its data fails to include supply from the next generation of hoteliers (i.e. Airbnb). 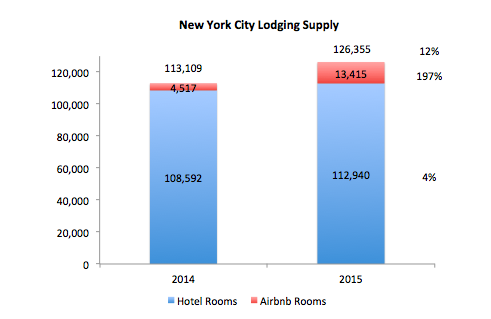 While hotel room supply only grew 4%, Airbnb inventory increased 197%. Including Airbnb, there are already 126.3K rooms in New York City, and room supply grew by 12% last year. While hotel occupancy has declined, total lodging demand in New York has increased over the past year. Even with very conservative assumptions about Airbnb listing utilization (say 33% occupancy vs. 68% hotel occupancy), the number of lodging guests has increased over the past year. This data is the proverbial canary in the coal mine that Airbnb’s On Demand hospitality model is stealing share from hotels. Since New York is Airbnb’s largest domestic market and one of the most sophisticated, competitive lodging markets in the country, one would expect to see Airbnb’s impact here first. It is similar to the impact Uber has had on San Francisco taxis, leading to a -65 percent in taxi usage. These facts sharpen the political and regulatory debate about Airbnb. Should these hosts pay lodging tax (which supports NYC tourism generating activities)? After all, the owners of Airbnb listings clearly benefit from the city’s demand generating initiatives, and with nearly 10% of the market now not paying tax New York City is losing out on needed resources. And what about the impact on neighborhood character? Today it’s hard to argue that Airbnb is a fringe activity with limited community impact. For hotels, regulatory issues are interesting but the burning question is how to stop Airbnb from picking their pockets and stealing their guests. Airbnb’s On Demand experience provides a travelers with a direct connection to hosts and immediate service via mobile communication. While hotel guest experiences are evolving — witness Marriott’s Travel Brilliantly initiative, Hilton’s room selection tool, Starwood’s front desk by-pass pilot, CheckMate’s On Demand platform — too few hotels are keeping pace with Airbnb’s innovation around the guest experience. To staunch the bleeding, hotels must raise their game in the guest experience, and stealing a few Airbnb practices is a good place to start. The definition of service is evolving, and growing percentage of consumers now expect immediate access to service and information via a mobile device. Hotels must cater to this audience and allow guests to instantly check-in, upgrade, ask questions, or make requests. While hotels can’t control the decline in the Euro or whether or not New York gets another Super Bowl, they can fight to regain lost market share by providing the tools guests now demand. Drew Patterson is the CEO and co-founder of Checkmate.